Handling rates for scrap increased five-fold and maximum functional reliability in continuous operation. SYDNEY, 6 March 2012 – A Demag double-girder process crane is now responsible for the fast and reliable collection of scrap material and its transfer to the induction smelting furnace, at Swedish iron foundry Arvika Gjuteri AB. The foundry commissioned the new Demag process crane, which features an integrated weighing and position measuring system, as part of its strategy to considerably increase its handling rates for scrap in line with its increased production capacities. For the company, this is an important step in consolidating and further expanding its competitive position on international markets. 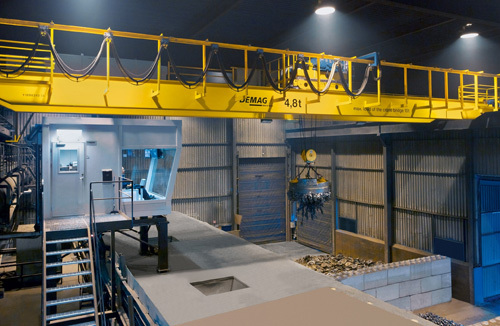 The Demag ZKKW double-girder process crane has replaced an older crane model and is responsible for much faster and more reliable collection of scrap material, also known as charge make-up, and moving it to the smelting furnace. With the old crane, the Arvika employees had to work 24 hours a day in the scrap yard and melting shop, now the new crane can handle the same weight of scrap in less than two shifts. So the charging crane is also designed for future increases in capacity. “The start of productive operation already confirmed our decision to trust Demag Cranes as a solution provider to supply us with tailored technology”, continues Anders Nilsson. At Arvika Gjuteri AB, the scrap is prepared and correctly sorted in nine boxes. Orders for material pick-up are transmitted to the crane staff in the control station. The orders include information about the quantities to be removed from each of the individual boxes. These quantities are specified in formulations so that the resulting cast material contains exactly the desired properties. The crane, which works five days a week in two-shift operations, first takes the material with the largest quantity from a box and, at the same time, determines the weight via calibrated crane scales integrated in the open winch crab. On the basis of this data, the quantities for further material are determined, transmitted to the cab by radio and displayed there. As soon as the desired final formulation is complete, the mixture is then tipped onto a heap of scrap from where it is conveyed to the smelting furnace. The more precisely the respective mixture is produced by the crane, the fewer high-cost alloys are required. The Demag ZKKW double-girder crane has a span dimension of 22.65 metres and travels on a 40-metre-long crane runway. It is equipped with a multi-purpose MPW open winch, characterised by its compact and maintenance-friendly design. The load is picked up using a round magnet connected to the hoist by a 4/2 reeving arrangement. High handling rates require high speeds. With up to 80 m/min in long travel, cross travel from up to 60 m/min and load-dependent hoist speeds up to 66 m/min, the crane corresponds exactly to this requirement profile. Infinitely variable motions in three axes are regulated via frequency inverters, thus contributing to safe operation in two shifts, five days per week. The crab and crane are equipped with cameras via which the process is permanently monitored in detail from the control station. This control station is installed as a cab. Demag Cranes has equipped the control panel inside with ergonomically arranged operating elements. Arvika Gjuteri produces high-grade castings, primarily for the commercial vehicle industry. The components and solutions of the company are supplied mainly to global companies that produce commercial and off-road vehicles. Arvika Gjuteri has been owned by the Sixth AP Fund since 2009. The Sixth AP Fund manages general pension funds and invests its capital primarily in small and medium-sized Swedish companies.